The Backcountry Slam by William Depaula - 6.625" x 8.000"
The Backcountry Slam metal print by William Depaula. Bring your artwork to life with the stylish lines and added depth of a metal print. Your image gets printed directly onto a sheet of 1/16" thick aluminum. The aluminum sheet is offset from the wall by a 3/4" thick wooden frame which is attached to the back. The high gloss of the aluminum sheet complements the rich colors of any image to produce stunning results. There are no comments for The Backcountry Slam. Click here to post the first comment. 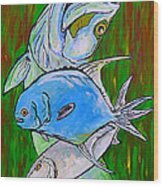 It is always hard to have a cool looking grand slam fish design. If you have the fish swimming right next to each other it is rather boring. 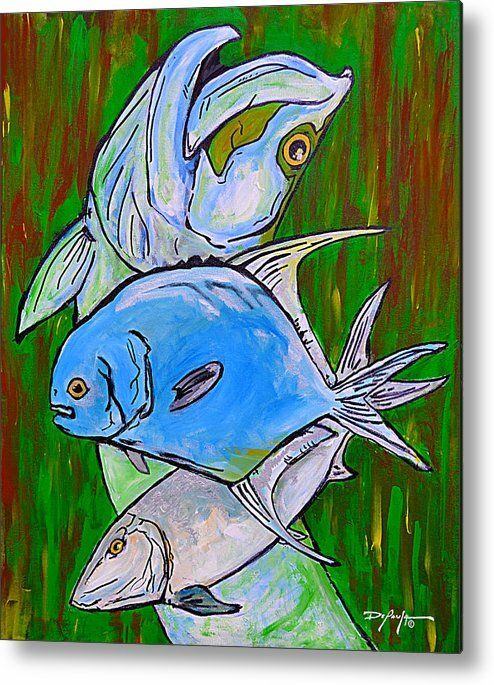 So after much debate I created this design of backcountry fish which include a Tarpon, Permit, and Bonefish. 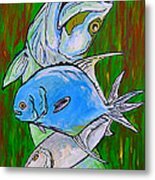 When designing this painting, I wanted the fish to be posed in a graphically designed way, but at the same time still have some movement to them. Hope you enjoy the Backcountry Slam, a fish painting that includes a Tarpon, Permit and Bonefish. 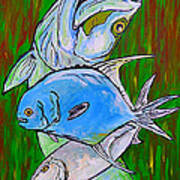 Fish Art by the Island Artist, DePaula.